It seems everyone these days needs somebody to code something. I mean, from the local lemonade stand to Fortune 500 companies, everyone needs someone to write code for them. For their website. Their app. Their smart______. Thus, the ability to code has become one of the most prized skills in the modern workplace. If you can code, you can probably get a job. (And if you can’t, you can probably create a killer app that becomes the next big thing, and then you can be the one hiring people.) The problem is, of course, that only a small number of people know how to code. Which means that there aren’t enough coders to go around for every company. Being the tech enthusiast that I am, I got both of them. But now the question is, which of them is better? Read on, and I’ll discuss. On the surface, both games do the same thing, really. You write a bunch of code, and then you run it, and see whether your character can complete the mission using the code. From there, of course, the two begin to look rather different. There’s a thing about this: HR Machine is really a puzzle game, while Playgrounds really tries to teach you coding, and this is where most of the differences between the games show up. In HR Machine, once you figure out how to write a wee bit of code, you’re off, and each puzzle progressively creates more head scratching and hair pulling. In Playgrounds, on the other hand, you’re taken step-by-step through the whole thing, and the learning curve is far more gentle, with the game allowing you to learn one concept at a time. So to be straight: HR Machine forces you to come up with most of the ideas yourself, while Playgrounds helps you along that path. No, I’m not talking about apps. I’m talking about how applicable the games are to real life coding. And here’s where the biggest divide comes. Tomorrow Corporation, as far as I can tell, created their own language for HR Machine, and the language is specifically built to play the game. And while this does teach plenty of concepts, you can’t exactly use the game’s language to write code anywhere else. 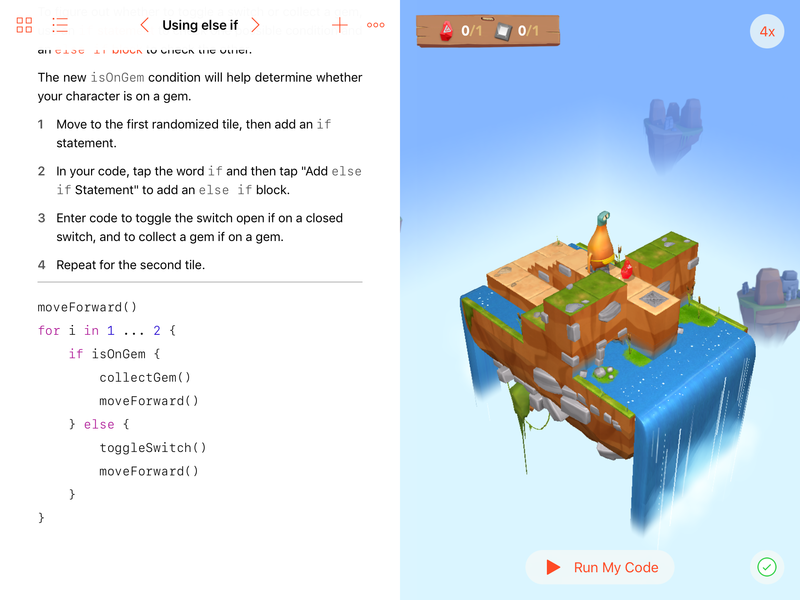 Playgrounds, on the other hand, uses a proper coding language in the game: Swift, Apple’s very own coding language, used to create apps for macOS, iOS, watchOS and anything other gizmos Apple has. (Maybe, in the future, even carOS.) So if you want to create the next Snapchat, learning Swift is probably one of the first things you should do. So if you want to learn concepts, play HR Machine, but for an applicable language, play Playgrounds. I’m kind of sorry to say that there’s really no competition here. HR Machine tops interface hands down. I mean, you’d think that Apple, with its 115,000 employees, could have at least outdone a 3 man team in designing a usable interface. In a language they invented. That’s not to say that Playgrounds had a bad interface. But it’s clunky. Yes, maybe it’s because it’s hard to type in general while using a tablet, but again, given that Apple owns Swift, the iPad, and iOS, you’d think they could’ve circumvented the problem. Another thing: it doesn’t have a function that tells you which line of code is running at any moment, which means it takes a bit of reading to find which line of code is messed up. On the other hand, HR Machine didn’t have any of those problems. But then again, the game provides code blocks and doesn’t allow you to write your own text, so there’s a little trade off there. But overall, HR Machine‘s interface was far smoother than Playgrounds‘. If you asked me, right now, which I would want to play more, I would have to, after a pause, admit that I would play Playgrounds, not because of any virtues of that game, but well, because, I’m stuck on a level in HR Machine. I mean, overall, comparing the two is like comparing an apple (no pun intended) to a pear. I mean, HR Machine‘s main purpose was to create a puzzle game, while Playgrounds main purpose was to train a new generation of coders. And it shows. HR Machine has is a beautiful game with a mysterious storyline and funny characters, while Playgrounds is a game designed by, well, a tech corporation. 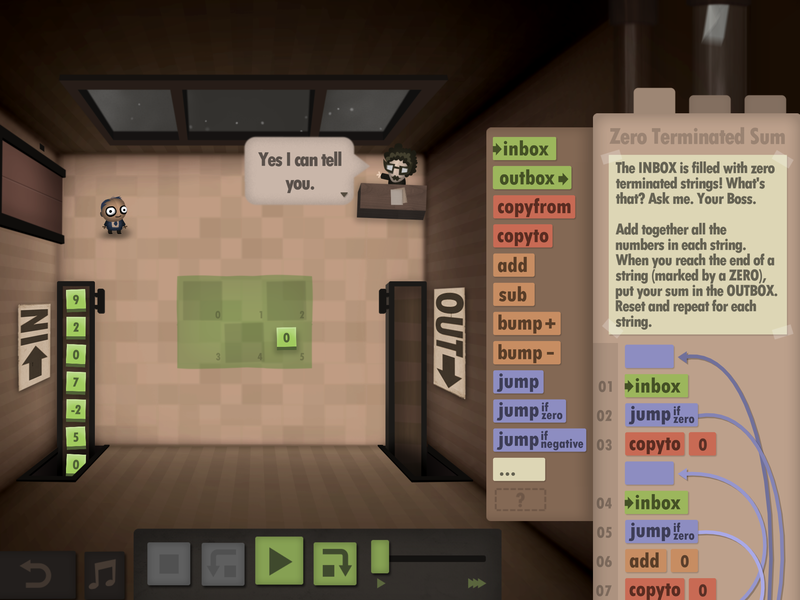 So in case you were looking for a verdict on whether to get them or not, here’s the thing: Human Resource Machine is available, for purchase on Windows, Mac and Linux. (Oh, and iOS.) Swift Playgrounds, is, of course, only available for Mac stuff. But it’s free. So if you are interested in coding and want to learn, I would highly recommend both.